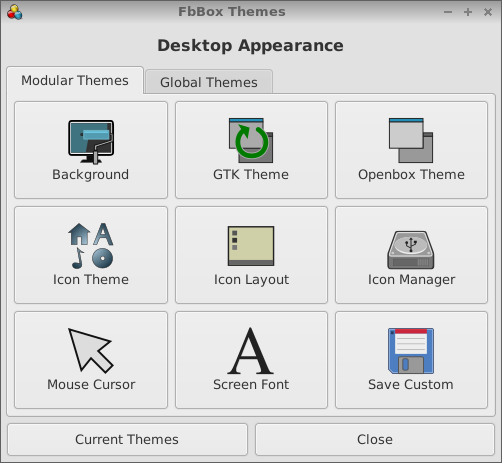 • FbBox is a full-featured desktop environment for Puppy Linux, featuring fbpanel and the openbox window manager. • Fbpanel-7.0 is a lightweight, NETWM compliant desktop panel which includes an enhanced version of the Fbpanel Configuration Manager that features built-in (optional) panel monitors such as CPU-temperature, CPU-load, Network-activity and Battery-status. The 'Help' button of the Fbpanel Configuration Manager provides quick access to panel guidelines. 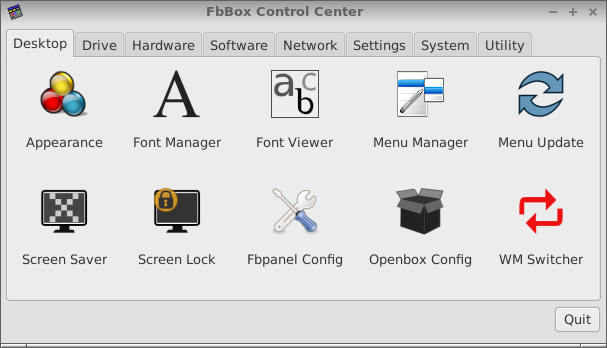 • Openbox-3.6.1 is a popular, full-featured window manager which can function independently as a complete desktop environment, but also integrates perfectly with accessory panels – including fbpanel in the FbBox desktop environment. • Add optional SysInfoBar (3rd panel) for the real-time display of current system status (similar to conky). Enable/Disable in Fbpanel configuration (pfbpanel) -> Desktop tab -> System information bar. • Add multiple new keyboard shortcuts for openbox. Note: Other keybinding utilities such as Xbindkeys may override the assigned hotkeys. • Bugfix: Due to strict error messaging by libpng version 1.6+ (Slacko 7.X), the repeating xerrs.log message "iCCP: known incorrect sRGB profile" required removal of outdated png sRGB profiles in the following GTK themes: Murrine, FlatGrey, Ambiance, Zukitwo, Radiance and Dark. 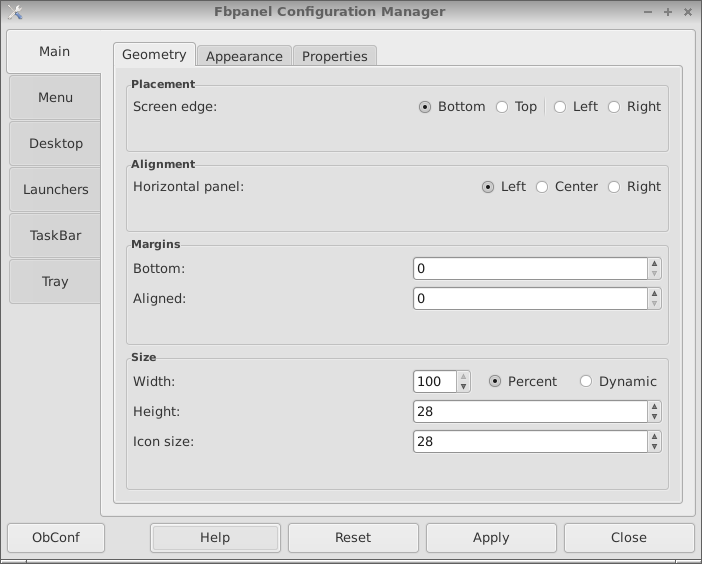 The fbpanel configuration options are accessible by clicking the preferences icon on the panel, or you can use the FbBox Control Center (Puppy Menu -> Control Center -> Desktop tab -> Fbpanel Config). By default, the launch bar of the main panel and the accessory launch bar are enabled when FbBox is first installed. Go to Puppy Menu -> Control Center -> Desktop tab -> Fbpanel Config -> Desktop tab -> Panel Bars -> select true or false to enable or disable each of the panel bars. The accessory launch bar is similar to the popular wbar utility. Configuration options are available by clicking the left (or top) icon of the accessory launch bar and selecting Preferences in the drop-down menu. The system information bar (sysinfobar) is similar to the popular conky utility. Configuration options are available by clicking the bottom icon of the sysinfobar and selecting Preferences in the drop-down menu. In addition to the basic textual and graphical monitors displayed on the desktop, the sysinfobar provides comprehensive system information via optional tooltips. Go to the Plugins tab of the Fbpanel SysInfoBar Manager to enable/disable sysinfo tooltips (Tooltip stats). Please note, the report of the optional weather plugin is displayed in the tooltip of the Date plugin. • On first run of FbBox, the modified WM-Switcher utility initializes FbBox and runs additional distro-specific scripts which are required for complete implementation of the FbBox environment. Please run WM Switcher immediately after installing FbBox. 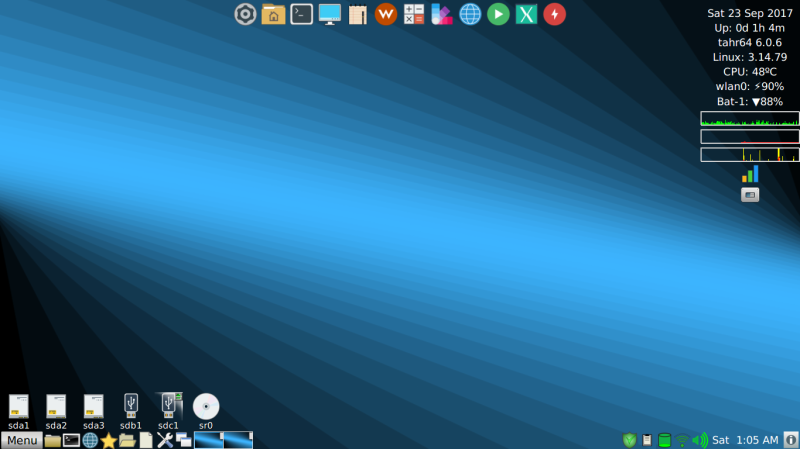 Thereafter, when switching between FbBox and the default JWM desktop, the WM-Switcher utility maintains the appropriate user-selected gtk theme and wallpaper for each desktop environment. Specifically, FbBox is an optional, switchable desktop environment. • The WM-Switcher utility mediates switching between the FbBox desktop environment and the standard JWM desktop. Switching to other desktop environments is not supported. • FbBox supports Woof-based Puppies - but does not support the legacy Lucid series, and is not designed for integration with custom derivatives such as Carolina, LxPup or X-precise. • When you exit to the command prompt at any time, please enter 'xwin openbox-session' to reload the FbBox environment (not xwin openbox). Also, the modified WM-Switcher utility calls openbox-session when automatically switching to/from FbBox. • When changing the color of folder icons (Global Themes option), Rox-Filer does not always update the new folder image automatically. Consequently, after changing the folder color, a simple click of the 'refresh button' in the Rox menubar may be required to rescan directory contents. • The graphical interfaces of some Puppy-specific scripts (such as shutdownconfig and Pudd) may utilize pastel background colors that are designed for black text. Unfortunately, the pastel (light) background diminishes readability of the default white text of many GTK dark themes, including the Dark-grey theme of FbBox. In this scenario, use the mouse cursor (if possible) to highlight the text for improved readablity. Also, if you install FbBox in Precise-5.7.1, Racy-5.5, Slacko-5.5, Slacko-5.7 or Wheezy-3.5.2, the Dark-grey theme will require an updated libpixmap.so file (/usr/lib/gtk-2.0/2.10.0/engines/libpixmap.so). For the aforementioned older Pups, the libpixmap.so file copied from Tahrpup-6.0.X works fine. Fortunately, the default libpixmap.so file does not require updating in other legacy Pups such as Raring-3.9.9.2, Slacko-5.9.3 and Wary-5.5, or in modern Pups such as Barry's Quirky variants and the 6.X/7.X series of Woof-CE Pups. • When switching back to the JWM environment, an updated JWM configuration module (JWMdesk) simplifies management of legacy JWM and fully supports the new XML configuration of modern JWM >=2.3.2. Nice! I will be testing this out very soon. Thanks, radky! Would you be able to post a separate pet for just fbpanel? I want to try and combine it with other window managers.. I was wondering if PupMates, right-click, help additions, sensors etc, but the wm-switcher, could become an optional/separate install. They may be already installed or just not needed by the user. For a current fbpanel package, you could try the link below to the Salix repository. BTW, your customized Puppies are very nice and we look forward to your next release. Thanks for downloading and testing FbBox. As you can probably imagine, this project has required considerable thought and testing to assure relatively smooth integration with multiple Puppies, both 32Bit and 64Bit. Granted, the Pupmates are my personal choice but the updated versions included in FbBox also have functional importance. For example, running openbox as openbox-session requires additional shutdown code not provided by wmreboot or wmpoweroff, and this code is included in the new 2.1 version of PupShutdown. PupMenu-3.5 has new code for managing the XDG menu including the new 'Favorites' category, and I think this functionality addresses some of the deficits of the menu as currently implemented in Puppy Linux. Also, in my opinion, one of the long-standing shortcomings of mainstream Puppy is the lack of a control panel, so I included an updated PupControl (which does not link to the desktop setup icon without user permission). Each Pupmate in FbBox has new code for proper integration with the desktop. The Rox right-click option of FbBox extends the functionality of Rox-Filer, but does not install if the pinstall script detects don570's popular right-click package is already installed. Of course, the pinstall script does not currently detect other right-click packages the user may have customized for personal use. The help additions for mtpaint, gnumeric and sylpheed are provided by playdayz to repair those options that are broken in the base Puppy. Actually, this package is quite small and does not add significantly to the size of FbBox. I suppose the sensors package could become optional, but I think the CPU temperature monitor in fbpanel is a very nice feature and should be functional on first boot in a wide spectrum of hardware installations, without requiring additional packages. Yes, the wm-switcher utility in FbBox has additional code required for properly switching the JWM and FbBox desktops. This modified version is essential to FbBox. So, to answer your question, the current options in FbBox provide a relatively unique desktop environment, and certainly this includes my personal preferences. Even so, FbBox may be of interest to those who prefer a user interface beyond that of the base Puppy. On the other hand, if you prefer to add current releases of fbpanel and openbox to the base Slacko Puppy (without FbBox components), you could try the following packages from the Salix repository. 1. Menu -> Setup -> Puppy Package Manager; search for lxterminal; click to install (Precise will need to also install a dependency). 3. Right click console again and choose File console -> Set icon. Then open rox to /usr/share/pixmaps, and drag lxterminal.png into icon space. 4. To have rox open lxterminal when right-click in directory window -> Window -> Terminal Here, edit /root/.config/rox.sourceforge.net/Rox-Filer/Options and replace <Option name="menu_xterm">xterm</Option> with <Option name="menu_xterm">lxterminal</Option> and save. Add: You will need to restart the window manager for the change in #4 to take effect. Add2: Forgot one--the panel launcher. Click the wrench and choose the launchers tab--change xterm to lxterminal. Thanks for your report on FbBox and Quirky (Tahr). It will be interesting to follow Quirky as it moves beyond the current experimental status. PS - I like your background wallpaper. Lxterminal is a nice addition to FbBox (which also has the companion lxtask as the default task manager). Impressive, works well with your other apps. You've been busy. Slacko64 is early alpha but I find it very stable and a nice distro for integration with FbBox. Thanks for sharing your experience with the 64Bit version. Slacko64, alpha 2 is working great with your FbBox-1.0 on my hardware. Glad to see that PupSnap is now working on Slacko64. Glad to see that PupSnap is now working on Slacko64. Jim, for quick access to PupSnap in FbBox, you can use the keyboard 'Print Screen' button. Awesome job on this it works good on the latest Manna OS. All the gui's look clean and very professional. I see that SSC has been updated too. Very nice work.